Serenity Essential Oil Blend diluted in Massage Base (ready to apply). This blend is made with beautifully fragrant and deeply comforting oils that help the mind, body and spirit to cope with times of unusual stress and tension. Premixed in our own Massage Base. Use directly from bottle for soothing and totally relaxing massage or, add a cap full to a warm bath. 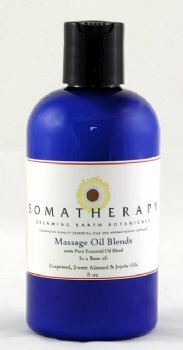 A blend of 100% pure Essential Oils: Clary Sage, Lavender, Marjoram, Petitgrain and Ylang Ylang in our Massage Base (a combination of Sweet Almond, Grapeseed & Jojoba oils).